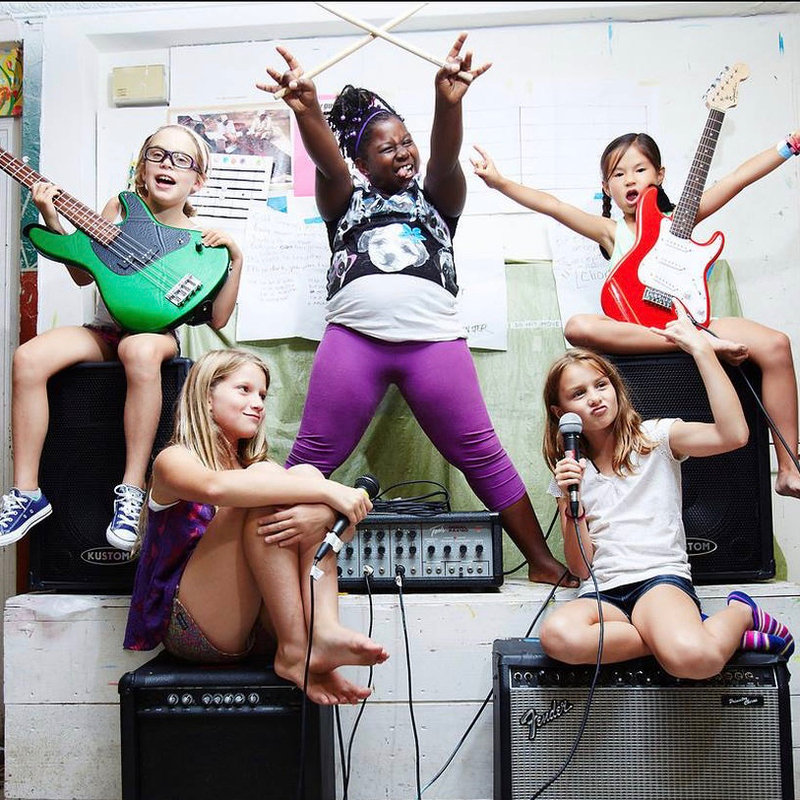 Empowering girls to believe in themselves by providing a supportive community that fosters self-expression, confidence and collaboration through music education and performance. Hello! I am Nora Allen-Wiles, co-founder and Executive Director of Girls Rock Campaign Boston (GRCB). I help girls and women believe in themselves by teaching them how to play rock n’ roll. I was first introduced to building community through mentoring and rock n roll when I interned with the Rock n Roll Camp for Girls in Portland, OR in 2007. When I witnessed girls grabbing hold of the microphone to speak their mind, whether that be about their love electric pandas or how they would tear down the patriarchy, I knew that this mission would change the world and I needed to help make that happen. In 2010, I co-founded Girls Rock Campaign Boston and 8 years, 15 summer sessions, and over 300 all-female bands later, I am still incredibly excited to go to work and fulfill our mission every single day. Inspired by years of watching eight year olds fearlessly rock the drums and scream into microphones, I too conquered my fears of getting on stage and currently spend a lot of time playing drums and singing with my two bands. Born and raised in Somerville, MA, I now live in the Boston neighborhood of Jamaica Plain with my wife and our dog, Panther. Girls Rock Campaign Boston (GRCB) empowers girls to believe in themselves by providing a supportive community that fosters self-expression, confidence, and collaboration through musical education and performance. GRCB currently runs two week-long summer sessions where 130 girls, ages 8-17, receive technical instruction on bass, guitar, drums, keyboard, or vocal, form bands, and write songs. At the end of the week, girls perform in front of hundreds of audience members at local music venue, Brighton Music Hall. Participants are also given the chance to experiment with other artistic media and attend daily self-esteem building and empowerment workshops such as Media Literacy and Intersectional Feminism. During the school year, Club GRCB is a weekly after school program for girls in 6th-12th grades that provides workshops and band practice. GRCB BEATS is an in school, after school program that combines art, technology and music, currently serving youth in Somerville and Dorchester, MA. There is no experience necessary to participate in any of our programs and all equipment is supplied. All lessons, band practices, and workshops are facilitated by female volunteers in order to provide positive role models for our participants. Telling a girl to have confidence can feel like an abstract concept and telling a girl that she will be able to perform in front of hundreds of people only five days after she picked up a guitar before seems impossible. But when she screams into a microphone, bashes a drum kit, or turns her electric guitar up as loud she wants, she is doing more than playing music, she is learning that she has power and that she can accomplish anything she sets her mind to. As one participant remarked on her experience at GRCB, “Now I can scream! I will NOT be apologetic for being who I am.” We believe girls need positive female mentors to encourage confidence in their own abilities in order to become leaders in a world that frequently minimizes their voices. GRCB counters gendered messages career and social expectations that girls absorb as well as society’s expectations of how they should act and which professional avenues they should pursue. Instead of internalizing preconceived notions of appropriate femininity, GRCB empowers girls to recognize and transcend them. “Girls Rock Campaign Boston gives me an outlet to be loud and proud to be a girl; a place where my opinion matters.” Our programs have been proven to help girls grow measurably in confidence, self-expression, peer support, and collaboration skills. After just one week of programming, 98% of girls strongly believe they have good ideas, 96% believe they were good at helping people and 92% of participants feel encouraged to look and act the way they want. Providing a safe space for girls and women to take risks and explore self-expression, GRCB programs are a key element in fostering leadership and confidence as girls transition into adult lives. As one parent remarked, “Your instruction, programming, and just general presence are powerful tools that she can refer to every day. Being around an amazing group of strong and diverse women is the best education she can get."